Mardi Gras is quickly approaching, and kids will love getting into the fun and exciting holiday spirit! Mardi Gras celebrations traditionally involve lots of music, colorful parades, costumes, and lots of fun and vibrant flare. Kids can’t help but be mesmerized! 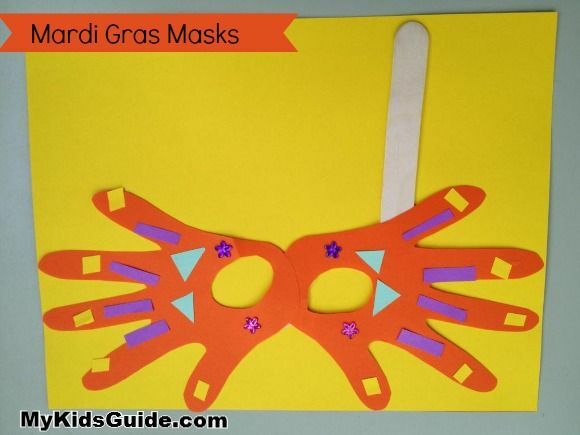 This Mardi Gras, get kids involved by making your own simple Mardi Gras Handprint Mask crafts! This craft is simple to make and uses supplies you may already have around the house. Kids love playing dress up, and this Mardi Gras mask craft is perfect for you to conduct your own party or parade. Just add a few colorful accessories and noise makers and you are really to roll. Embellishments such as beads or sequins or stickers. First, trace each of the child’s hands on construction paper. They love how this tickles! Cut each hand out and make holes in the palms for eyes. Decorate the hands around the eye holes with your embellishments. Place a dab of glue on the palms and glue them together to create a mask, as shown. Add glue to your craft stick and attach the mask. The stick will act as a handle to your mask. That’s it! You are now ready to wear your Mardi Gras mask! Once you have your masks created, it is time to celebrate! Why not have your own parade, fun plays, or party? Include lots of colorful decorations, music, noise makers, fun indoor games and snacks. It is fun to see how each child does their mask differently and show their own individuality. Want to enrich this Mardi Gras craft activity further? Check out the book Mimi’s First Mardi Gras by Alice Couvillon. It is a family friendly story all about a little girl’s adventures with Mardi Gras. It teaches new vocabulary, has beautiful pictures, and leads the readers on quite an adventure. It compliments this Mardi Gras craft quite well. So gather the kids around and make your own Mardi Gras Handprint masks! 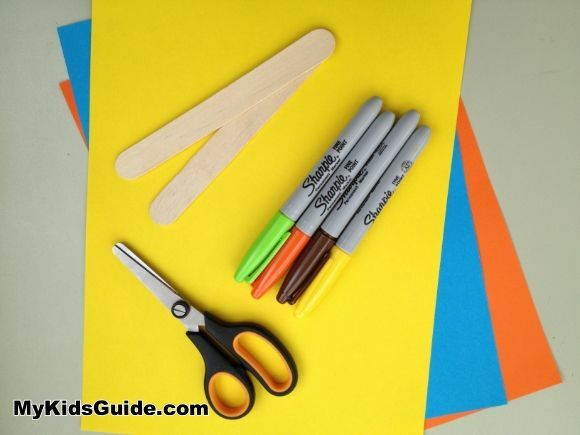 You will love how colorful they are and how simple this craft is to do. Plus, it is inexpensive since you can use items you probably already have around the house. Kids will love getting their hands traced and being able to decorate the masks themselves, and of course, they will love wearing them. Those are so cute! Seriously, I can see my kids having a blast with those masks! They would never let me get rid of them. they would play with them all the time. Much cuter than a typical round paper plate with eye holes cut into it. Amber Edwards recently posted..Chocolate Chip HotCakes Recipe, Thick & Fluffy Pancakes your kids will love. How cute! This is a great keepsake because of the handprints. I’m sure it’s fun to make too! My kids are teens and so they are past the craft-making stage. But, this looks like a very cute and fun idea. Those are really cute! My kids would enjoy making them.